UK Prime Minister Theresa May and His Highness the Aga Khan meet at 10 Downing Street during the Aga Khan's Diamond Jubilee year. Leaders discuss ongoing collaboration on education, economic development during a meeting at 10 Downing Street as part of Diamond Jubilee visit of His Highness. London, United Kingom, 27 June 2018 - UK Prime Minister Theresa May today emphasised the importance of ongoing collaboration between the Ismaili Imamat, the Aga Khan Development Network, the Shi’a Ismaili Community and various departments of the UK Government to improve the quality of life for disadvantaged communities around the world. The meeting, held at 10 Downing Street - the official residence and the office of the British Prime Minister - was part of His Highness’ Diamond Jubilee engagements in London this week which included meetings with government officials and commemorations with the Ismaili Community. The Aga Khan is celebrating 60 years since his accession as Imam (spiritual leader) of the global Shia Ismaili Muslim community. Yesterday, also as part of his official Diamond Jubilee visit to the UK, His Highness hosted the inauguration of the Aga Khan Centre in King’s Cross, a place for education, knowledge, and cultural exchange. It serves as the new UK home to a number of international organisations founded by His Highness, including The Institute of Ismaili Studies (IIS), the Aga Khan University Institute for the Study of Muslim Civilisations (AKU-ISMC), and the Aga Khan Foundation (UK). Together the organisations housed at the building work to bridge the gap in understanding about Muslim history and cultures. 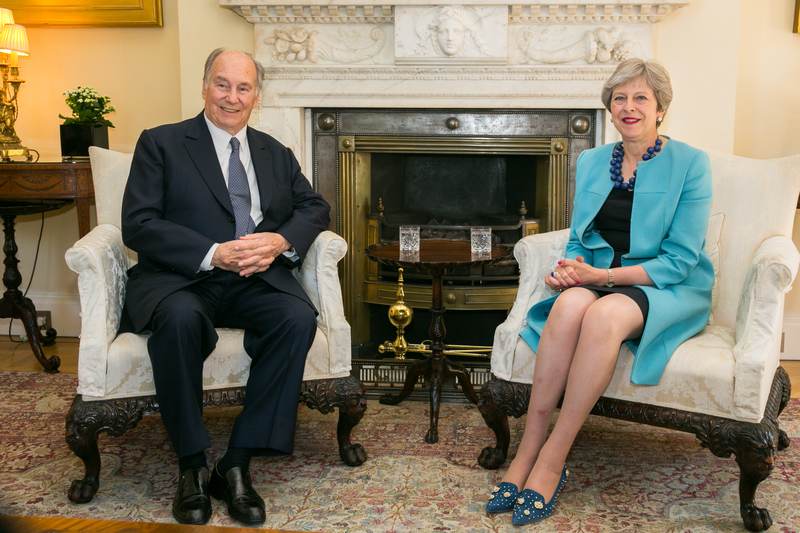 In his remarks, His Highness the Aga Khan thanked Mrs May and noted, that he looked forward to strengthening the partnership between Imamat Institutions and those of the UK. The Aga Khan noted that the UK has long been a leader in the field of development and it is an honour to work in partnership in fields such as girls' education where the projects are impacting not only young people today but the generations to come. "For over forty years, our institutions have contributed actively to the fabric of British civil society and its rich heritage of academic endeavour and international development, while fulfilling an international mandate which has a far reaching, global impact” he said. The Shi’a Ismaili Muslims in the UK are part of a multi-ethnic community whose members comprise a diversity of cultures, languages and nationalities. Today they are a global community, who contribute to their local communities with a special commitment to volunteerism and pluralism. The AKDN and the UK government have a long history of cooperation, spanning three decades. In 1988, the AKDN signed a strategic partnership agreement with the Overseas Development Administration. Over the past 30 years, this cooperation has deepened to include partnerships with the Department for International Development (DFID), including CDC (Commonwealth Development Corporation), and the Foreign Office. This work has focused on regions of the world such as Afghanistan, Pakistan, Central Asia, and East Africa. This unique partnership has also rested on a fundamental shared principle: that women and girls can and must be included in all programmes in order for development to be truly effective, equitable, and sustainable. AKDN’s conviction is that social development must also always be complemented with economic opportunities. The AKDN looks forward to working together on DFID’s economic development strategy for leaving no one behind – by connecting the rural and marginalised to digital finance; expanding agribusinesses that engage small-holder farmers to support families and communities; incubating and mentoring entrepreneurs and small businesses; and enhancing and expanding vocational training. The Aga Khan Development Network (AKDN) is working to improve the quality of life for tens of millions of people in 30 countries. Amongst the 1,000 or so AKDN programmes and institutions that currently operate in the developing world, many date back over 60 years, and some over a century. Today, the Network employs over 80,000 people. Its budget for non-profit social and cultural activities stands at nearly US$ 950 million. The Network's economic development arm, the Aga Khan Fund for Economic Development, generates annual revenues of US$ 4.3 billion. All surpluses generated by its project companies are reinvested in further development activities, usually in fragile, remote or post-conflict regions. For more information, please visit www.akdn.org.